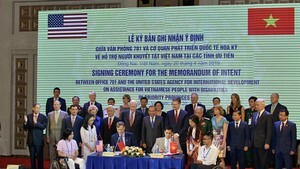 Vietnam gives a top priority to building a society where all nationalities are equal, unite, respect and help one another to co-develop, the Party chief has said. That is also one of the goals of national construction towards socialism, Party General Secretary Nong Duc Manh said during his meeting in Hanoi on May 10 with representatives of ethnic minority groups, who are gathering in Hanoi for their first ever congress scheduled to convene on May 11. Manh’s meeting was joined by National Assembly Chairman Nguyen Phu Trong. Both the Party and the NA leaders asserted ethnic people’s huge contributions and sacrifices to the nation’s revolutionary cause, in the past struggle for national liberation as well as in the current national construction and defence. 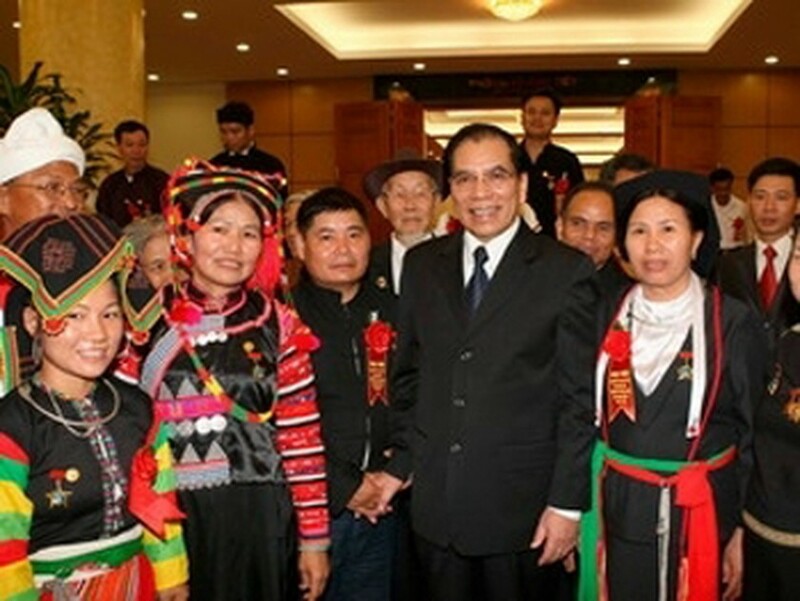 It was the great national unity which brought the Vietnamese great victory and a unified country, the Party chief noted, asking all ethnic minority groups in Vietnam to continue the tradition of solidarity to turn difficulties and challenges into development opportunities. He affirmed that the Party and the State will continue to pay attention to addressing essential issues of ethnic minority people, including reducing poverty, training officials and upgrading infrastructural facilities. “Investment in disadvantaged and ethnic minority areas is a strategic plan adopted by the Party and State. However, it will take time and require patience,” the Party leader stressed, calling on all ethnic groups to join hands in making the investments effective. He reminded ethnic people to preserve their distinctive cultural identities and promote fine traditional customs while carrying out development plans. The Party and NA leaders expressed their hopes that the first congress of ethnic minority groups will succeed and the delegates, when returning home, will become key figures to promote solidarity among ethnic groups. The leaders were also hopeful that the delegates will work enthusiastically to disseminate the Party and State’s policies and guidelines to their peers while resolutely fighting back hostile forces’ distortions aiming to undermine the great national unity bloc. At the meeting, many delegates hailed the Party and the State’s plans and policies for ethnic minority groups as well as for mountainous, remote and disadvantaged areas. They requested that the Party and the State pay greater attention to training and employing officials who come from ethnic minority groups, increasing investment in infrastructure in difficulty-hit areas, and educating the young people of revolutionary ethics and ideals. Earlier the same day, 100 persons representing 1,700 delegates to the congress of ethnic minority groups went to the northern midland province of Phu Tho to offer incense to Hung Kings, the country’s founders, at the Historic Relic Site of Hung Temple.